If you’re thinking of starting a small business, or already have one and are thinking of hiring a few employees, what’s in your way? Payroll. Not the act of paying someone – that’s pretty simple to understand – but all of the tax issues, paperwork, and dealing with bureaucracy that comes with establishing a payroll. That’s where the trouble lies. Paychex.com (877-768-2729) is one of those services that looks to cancel out any worries you have with these issues, a way to remove the whole idea of “complicated payroll systems” as an obstacle – or even an excuse – for growing your company. Sounds like an intriguing prospect indeed; the question is whether it can actually deliver on its promise of simplifying the entrepreneur’s life. If it can, sign me up. 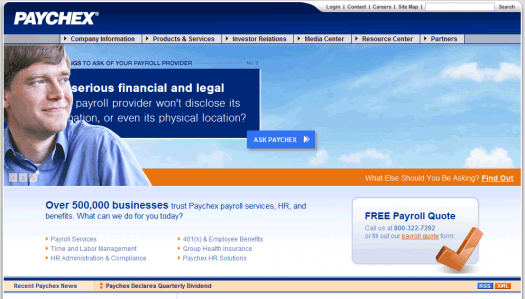 Payroll the Problem; Paychex the Solution? So where do we begin to evaluate a service that pretty much handles everything your payroll system needs? In other words, it’s not hard to find the comprehensive HR solutions at Paychex that essentially make a business go ’round. Suffice it to say, however, that Paychex isn’t exactly in a world without competition. So in order to make us truly swoon, it’s got to deliver one one and/or two points: comprehensiveness and the simple prospect of making my life easier. So does Paychex deliver on the “easy” factor? We found that it did. In fact, the entire range of services made available at Paychex is pretty much geared toward simplicity, almost as if Paychex understands our plight and would rather spend time actually making payroll easier than impress us with its dazzling array of features. That’s the kind of humility I like to see in a payroll system: don’t try to get lots of facetime, but instead get out of my way so I can focus on the more important things in life. This is achieved through a good awareness of what small business owners are thinking about. For example, consider that you can easily view net-and-gross employee incomes and tax deductions. Good! I don’t want to calculate that; I just want a button that shows me it if I’m curious and then leaves me alone after work. Paychex delivers the goods there, and that’s all I can really ask for. Another great solution: you can handle your general employee handbooks through Paychex, and ensure they’re compliant with state laws. This is good if you’re an aspiring tyrant boss like me and don’t want to get in trouble because of your manipulative, Mr. Burns-like policies. Paychex can help save you from yourself. So what to make of Paychex? It’s quite an elegant, simple solution for budding entrepreneurs who are responsible for the incomes of the professionals around them – and it’s the kind of service you’d want handling exactly that type of responsibility. And we like the fact that it doesn’t try to impress; like a good employee, it just tries to do its job well so it can go home at the end of the day. Hey, everyone’s working for the weekend anyway. To cut costs, we started using the Paychex payroll service instead of our accountant about six months ago. We’re saving around $150 per quarter. So far Paychex is working well for our business. We have an assigned rep who contacts us each quarter to verify the amount we want to pay. After that, they cut the check and file it with the IRS then send us a copy. Is anyone else using Paychex and if so, how is it working for you?